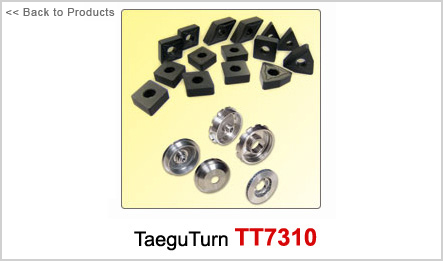 Taegutec is now introducing the new T-CAST grade TT7310, this cemented coated carbide insert has been developed for high performance turning applications on ductile cast iron. This new generation grade will provide exceptional performance on ductile cast irons and extend tool life considerably. Also, the new grade can be applied on gray cast irons. The TT7310 grade consists of a tough carbide substrate with an “all black color” CVD coating. This grade has been developed using a new post-coating treatment technology that will provide a smooth surface and excellent surface finish on the work piece. The exciting new grade has a thick coating with a tough carbide substrate that guarantees the inserts will deliver a good combination of wear and chipping resistance. A total 97 of these inserts will be released from April 2007. • The first insert dedicated to ductile cast iron. • Applied also for gray cast irons. • Excellent wear resistance and endurance to chipping. • Can be applied to roughing and finishing applications.